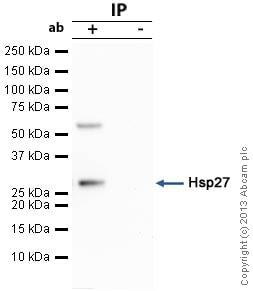 The antibody detects a 27 kDa protein, corresponding to the apparent molecular mass of Hsp27 on SDS-PAGE immunoblots, in samples from human, monkey, dog (weakly) and pig (weakly) origins. Our Abpromise guarantee covers the use of ab1426 in the following tested applications. ICC Use a concentration of 10 - 15 µg/ml. Hsp27 was immunoprecipitated using 0.5mg Hela whole cell extract, 5µg of Rabbit polyclonal to Hsp27 and 50µl of protein G magnetic beads (+). No antibody was added to the control (-). Proteins were eluted by addition of 40µl SDS loading buffer and incubated for 10min at 70°C; 10µl of each sample was separated on a SDS PAGE gel, transferred to a nitrocellulose membrane, blocked with 5% BSA and probed with ab1426. Publishing research using ab1426? Please let us know so that we can cite the reference in this datasheet. 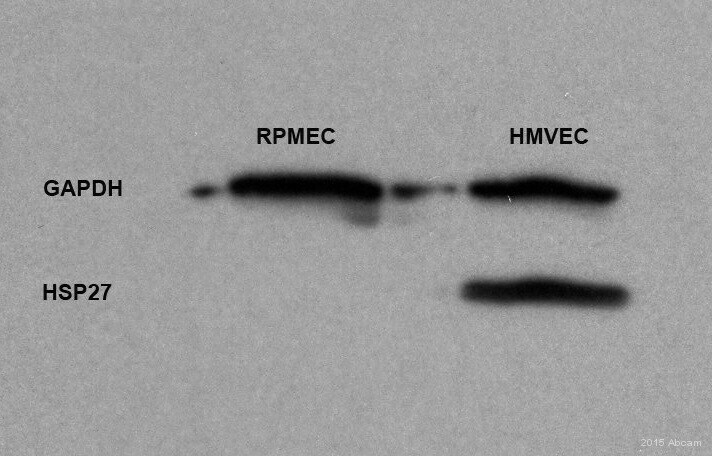 We need to be certain that this antibody only reacts to human HSP27, and not murine HSP27. We are working with a transgenic mouse that expresses human 27 in particular tissues. Thank you for contacting us regarding finding a product which will only react to human HSP27, and not murine HSP27. I do want to apologize for the delay in getting this information to you. Two of our products will fit your needs very well. ab1426: This product is very specific for human and monkey samples and weakly interacts with dog and pig samples. There is no reactivity with mouse samples. ab115856: I provided a BLAST against Human Hsp 27 and also did an alignment with the mouse version of this marker. There is around 80%+ homology but it must not be significant enough to get cross reactivity with mouse based on our data. The WB we have on the web for this one which clearly shows no bands for either mouse protein or mouse cell line. What is the actual immunogen for this antibody. It is not explicitly stated whether this was made against full-length human HSP27, etc. Recombinant human Hsp27 protein. If you have any additional questions, please contact us again.